I have volunteered as a small group leader at churches and camps since I was in high school and try to serve in this way when I can. Of course, it isn't as easy to be fully committed with having a family now. But because I jumped in to work with our church's 5th and 6th graders, I met Makenna. She. Is, Awesome. AND she's in her element. She is the Studio 56 leader at Chase Oaks Church and does such a great job. She and I connected right away and thankfully have stayed connected even though I had to take a break. She and I now work together on some cool apparel for the Studio 56 kids. Makenna and I feed off each other's creative vibes and it turns out to be awesome. 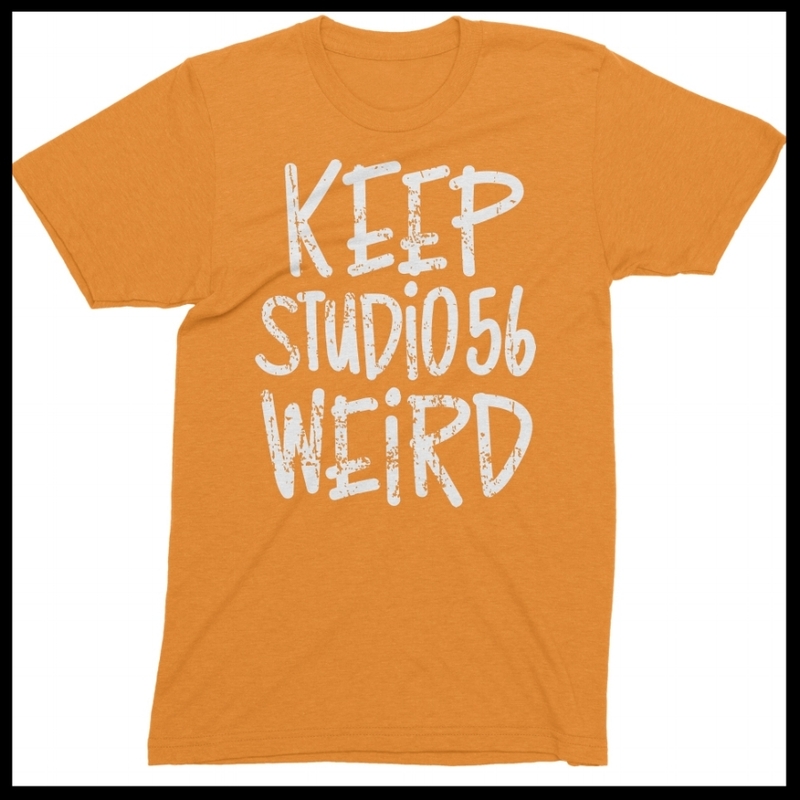 We started with a shirt to launch the "new" Studio 56: Keep Studio 56 Weird. Let's be honest, shall we? 5th and 6th graders can just be weird at this stage so let's embrace it! They should be able to walk confidently in their quirkiness while they seek the Lord and he helps them figure out who they are. I used my handwriting, added some distressing and chose to screen print it to create some depth. This super soft orange heather shirt by Next Level was the perfect fit and the goal was to have a bright color you don't see all the time. Winning! Plus, it helps that it's one of Makenna's favorite colors! I love seeing the kids wearing this shirt at church and at school. That was definitely the point: create some cool designs the kids like on a shirt the kids feel good wearing so they will actually wear it again! And it worked. We love it. Then I designed a shirt for the Life Groups that the kids and leaders received as a part of it. Again, something new that hadn't been done before and you can thank Makenna for it (plus our super cool church who supports her ideas!). Makenna did all the research on the wording and I used my handwriting and drawing to make it come to life. "ha ha ha ha haters gonna hate Proverbs 9:8"
We used the Next Level brand again, because as usual, they have plenty of nice colors on these high quality shirts in youth AND adult sizes. Who knew it would be hard to find both (the youth sizes are super limited! Well, in the soft not-cardboard-like shirts.). That's part of what I love: giving these kids unique shirts they cannot find anywhere else that look good on them and feel good, too. I screen printed these again which helps with printing a larger number but also with the distressed texture and lightweight print. We are now working on the next Life Group shirts. Let's just say there is a seed involved! More on that here!